Badha Parun Remix shot up Suman Shrestha’s popularity to new heights. 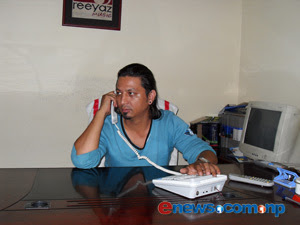 Suman ShresthaWith his new album on the cards Suman Shrestha handling the dual role of a Manager at Reeyaz music and a Singer is also busy singing in collaboration with other artists like DJ Yuva and DJ Tantrik. The recently released video of DJ Tantrik’s album “Kun Desh Ki Chari” vocalized by Suman is gathering rave reviews and he has also song “Diunla Yo Joban” for DJ Yuva’s next album. Suman stepped in Nepali music industry around a decade and half back with his keen interest to play bansuri. Then in 1992 AD he joined the band “The Angles” lead by Raju Lama as a guitarist. Then the band broke after some time and for two to three years he did not do any musical activity. After the gap he himself formed a new band called “Gigisa” of which he as the vocalist. The band released an album “Pani Muni Dhunga” of which the title track was a hit and largely appreciated. Then again the band cooled down due to reasons and he kicked off his solo career in 2000 AD with is solo album “Aduro Jiwan”. From this album two songs “Adhuro Jiwan” and “Aaunta Aayou” got rave review and success in the market. Then on release of his second solo album “Effort” which features the hit number “Badha Parun Remix” paved the path for his highlighted career ahead. Originally sung by Dwarika Lal Joshi, he had legally taken the rights from Ram Thapa to sing this masterpiece. 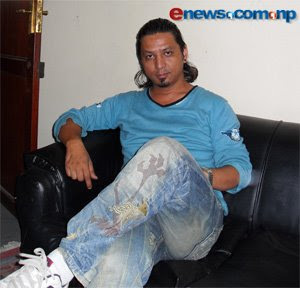 On being asked for the reason behind the instant success of “Badha Parun” Suman reveals that it was the time of remixes then and as it was the dawn of remix culture in Nepali music scene the song got instant popularity. On top of it, the song itself was very well composed and is an unforgettable evergreen gem of Nepali music. With already three albums under his belt, Suman is working on his fourth album which will be his third solo album. He informs that two songs have been recorded and six songs are ready on arrangement. Though the album name is not decided he adds that there will be minimum eight songs in the album. About the changes in Nepali music scene he utters that the establishments of new media has helped the artists but may have in some ways hampered the commercial aspects of music industry. In relation to his album he stated “Gajalu Ankha” is a very good song and he may even visualize the song. Other than that song “Aaja Pheri Timi” is also a soothing number from his upcoming album. Well versed in playing guitar and bansuri, Suman has taken formal training for playing guitar for one year and bansSuman Shrestha Manageruri for six months. He says self practice made him a better bansuri player. Except of the two instruments he declares he can also play tabla, dholak, harmonium and drums. On being asked three qualities a singer must posses he is quick to reply voice, dedication in singing and looks. He also adds that a singer must have good behavior. Personally liking sentimental songs he verbalizes that songs with importance to lyrics is what he is fond of listening to. Currently busy with his new album and his work at Reeyaz music he identifies himself as a hobbyist singer. With a message to stop piracy to save the artists and Nepali music, he urges all the audience to love Nepali music. It was nice interviewing him for Enews.com.np, he is a cool guy for sure.